When 3D Systems named the hot entertainer will.i.am to the newly created post of Chief Creative Officer, critics – especially those on Wall Street – faulted the company for pulling in a celebrity to a technology company. Personally, I thought, there was no one better from pop culture to help bridge the gap to mainstream markets. It turns out the collaboration with will.i.am has more depth than just a celebrity endorsement. Will.i.am is also an entrepreur with more innovative businesses than a clothing line or fragrance. Working with the Coca-cola company, will.i.am created ECOCYCLE to foster his personal belief in being environmentally concerned. Although the venture’s mission is to encourage eco-consciousness by leading the way to new products with recycled materials, arguably the beverage giant is trying to hold onto a business that generates more waste plastic than most small cities total garbage. So while the motivation may not be 100% altruistic, it’s cool to see a company the size of Coke making an effort to recycle and re-purpose the plastic they create. 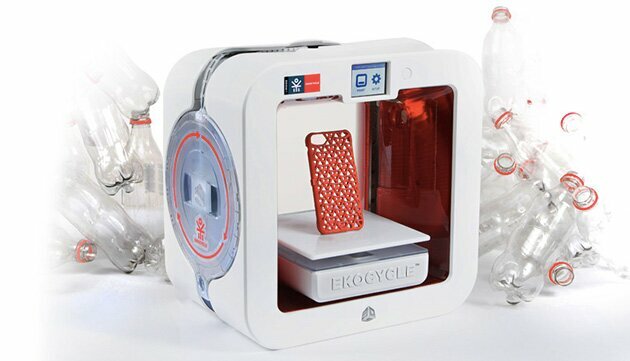 So the ECOCYCLE Cube 3D Printer was born. The newest 3D Printer in the Cube family is actually a proprietary machine that will process PET plastic, which is the type of plastic used to make soda and water bottles. The filament will be supplied in cartridges, accounting for approximately three recycled 20 oz plastic Coke bottles. According to 3D Systems Cube champion, Alyssa Reichental, it’s not possible yet to make filament of 100% recycled material so it’ll start with 25% post-consumer plastic. Which is a great start! The new ECOCYCLE Cube is due to be ready to ship later in 2014 and will be reasonably priced at $1199. 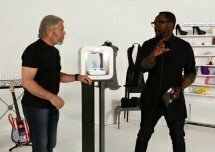 Plus will.i.am is guiding new, cool designs from the forefront of pop culture to ship with the desktop-sized 3D Printer. Not sure whether I’m more excited to get my new Cube3 or the ECOCYCLE Cube. While both are super products, “Re-making” is clearly the message with this new machine. Check out the full video for all the details.